The Garda Commissioner has said "zero work" has been done around the implementation of a hard border, as a result of the UK's decision to leave the European Union. Drew Harris was speaking at the quarterly meeting of the Galway City Joint Policing Committee this afternoon. He said a hard border was not on the agenda of An Garda Síochána at present and that this approach was in line with Government policy. However, he said he envisaged an increased demand to counter the impact of economic crime as a consequence of Brexit. Commissioner Harris said it would almost certainly lead to an increase in smuggling and a loss of duties to the Exchequer. In the meantime, he said there were ongoing efforts to respond to very obvious policing needs in border counties. These include the threat posed by dissident republicans, smuggling, organised crime and roads policing. The commissioner said these were very specific issues that needed to be addressed before even considering the impact of Brexit. He said he still had no idea what the implications of the UK withdrawal from the EU would mean for the border area. But he said the force had done "the sensible thing" to build up staffing numbers in the northern region, commensurate with existing policing problems. Mr Harris said it remained to be seen if the final Brexit arrangement would lead to a requirement for further garda resources in border areas. The Commissioner also outlined at the meeting how the force can evolve in the coming years. Commissioner Harris said he wanted to oversee the development of a victim centred policing service, which he said could be best summarised as "keeping people safe". This would be the guiding principle on which strategic and operational decisions would be made. He identified six headings that would drive changes in the force, with enhanced community policing, altered work practices and an improved focus on State security among the considerations. Mr Harris said there was a trend where crimes against property were diminishing but crimes against vulnerable people - such as domestic abuse, trafficking and child abuse - were on the increase. Having improved mechanisms for the sharing of information with other State and voluntary agencies would be central to tackling these crimes. Answering questions in relation to Community Policing, Commissioner Harris said this should be based on a visible, problem solving approach that needed to be adaptable to suit requirements in different parts of the county. The Commissioner said there would 600 new Garda recruits this year but that this would be offset by the retirements of around 300 members. However he said there should be a total of 800 more officers available for all aspects of operational deployment in 2019. Commissioner Harris said this was a very significant increase, which would allow the force to develop "its operational edge". He told the JPC that new regional cyber crime units would be developed this year to enhance the Garda response to these types of offences. To improve national security, the Committee was told there would be increased collaboration with international police forces. 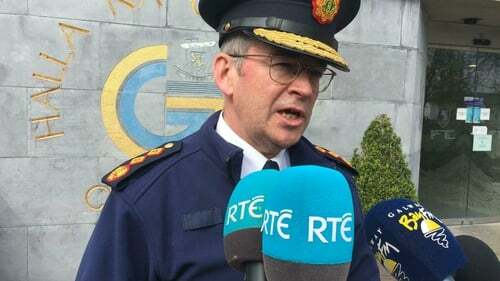 The Commissioner said he would like to increase the number of Garda Liasion Officers working with Irish embassies, particularly in the US and the Far East. He said these areas were being targeted by criminal gangs as places where they could move money to. Commissioner Harris also spoke about a number of regions, including Galway, where a new model of divisional policing is being piloted. As part of this initiative, a number of measures are being taken to increase interaction with the public, such a divisional social media accounts.